Never adjust the driver’s seat or seat back when the vehicle is moving. Before returning the seat back to its original position, make sure that cargo or any objects are not trapped behind the seat back. Note: On vehicles with memory seats, to prevent damage to the seat, the power seats are designed to set a stopping position just short of the end of the seat track. If the seat encounters an object while moving forward or backward, a new stopping position will be set. To reset the seat to its normal stopping position: 1. After encountering the new stopping position, press the power seat control again to override. 2. Continue pressing the control until it reaches the end of the seat track. 3. Continue pressing the control for about two seconds. You will feel the seat bounce back slightly. Note: The massage system will turn off after 20 minutes. Note: The engine must be running or the vehicle must be in accessory mode to activate the seats. Note: Allow a few seconds for any selection to activate. The seat back and cushion massage cannot function at the same time. • Seat cushion massage: Press and release the front portion of the massage control (A). Press again to cancel or press the lumbar control to cancel. • Seat back massage: Press and release the rear portion of the massage button (A). Press again to cancel or press the lumbar control to cancel. • Lumbar selection: Press either up or down on the lumbar control (B) to select the top, middle, or bottom part of the seat back. • Lumbar adjust: Press and hold the front of the lumbar control (B) to increase the firmness of the selected portion of the seat back or press and hold the rear of the lumbar to decrease the firmness. 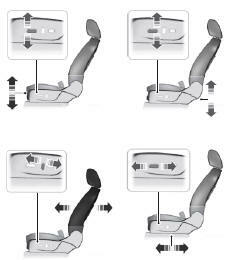 • Power seat controls (C) We recommend first selecting the lumbar to the desired setting and then selecting the back or cushion massage setting.